STATE Studio is ready to host you. 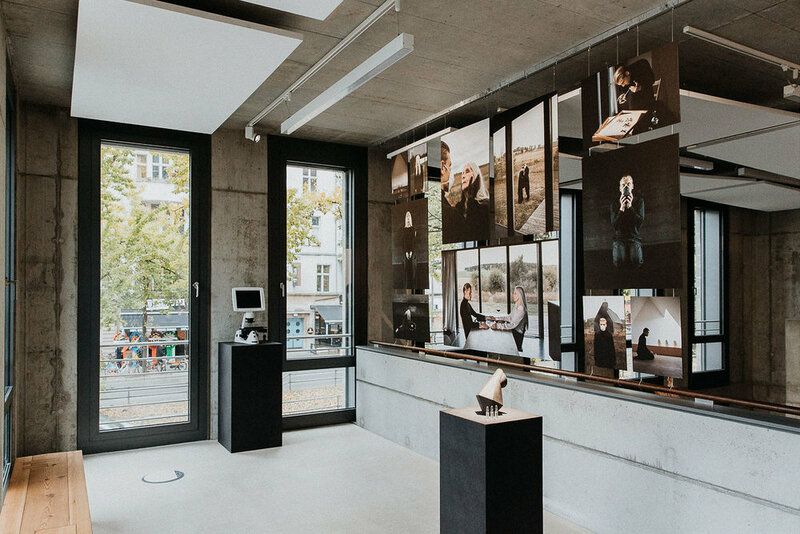 300m² bright and hybrid event space boasting stunning glass and concrete architecture located in the heart of Berlin. Plenty of Space for your ideas to breathe. Amidst our permanent exhibition of future science, arts and technology, STATE Studio provides a unique and inspiring setting for your event. The impressive entrance hall with its striking view into a bright and airy loft is both, functional and aesthetic. With its two panoramic windows, the contemporary and versatile space offers plenty of light and space for your ideas to breathe. The 110 m² studio space is flooded with natural light to provide a bright and versatile backdrop for your events. It includes projection area, an elevator (barrier-free access), a restroom incl. shower and kitchen facilities. Both intimate and airy, the private workshop and meeting space features immediate kitchen and restroom access to enable a smooth workflow. The picturesque view of Kurt-Hiller Park from within this unique creative space generates a positive atmosphere that is sure to make an impression on your clients. Half-day prices and reduced prices for non-profit organizations available. Ask us for our Opening Special! For cultural collaborations, please get in touch. *all prices as net prices. 19% VAT applies. We will get back to you within a day. For urgent requests please call.